Covered Calls is one of the simplest and basic option trading strategies that is frequently used by beginners to experts option traders alike. It is an option strategy in which you own stock and sell At-The-Money or Out-of-The-Money call options in proportion to the shares owned. The selling of call option is usually done on a monthly basis as a mean to collect rent while you retain the ownership of the underlying stock. Outlook: With this stock option trading strategy, your outlook is bullish to neutral. You are expecting a mildly rise in the underlying stock price and/or a drop in volatility. Limited. Occur at expiration date when the underlying stock is at or above the strike price and the options are exercised. Stock Price Paid less Call Premium Collected. This is a net debit trade as you are paying full price for the stock and it is only offset by a relatively smaller amount of premium collected. 3) Dividends on the stock. Can profit from three scenarios: underlying stock price rises, move sideways, or drop by a relatively small amount. Limited upside potential if the underlying stock rises. Unlimited downside risk if the underlying stock plunges and the premium collected will only be a small consolation. Inability to earn interest on the proceed used to buy the underlying stock. Let the options expired worthless and retain the entire option premium collected. You have successfully reduced the cost of the underlying stock as it is offset by the premium received. Sell another call option expiring in the next month to earn additional premium. In this case, you have already earned premium from the previous call sale, and you can earn additional premium from the second call sales, and so on. This process can be repeated every month, every couple of months or every quarter. Thus further reduce the cost of the underlying stock. If the share plummets, you may cut your losses by buying back the options that you sold and selling the stocks that you have bought in the first place. This can be done anytime prior to expiration date. In this case, the option premium cushion the losses resulted from stock decline and you are better off then simply buying the stock. 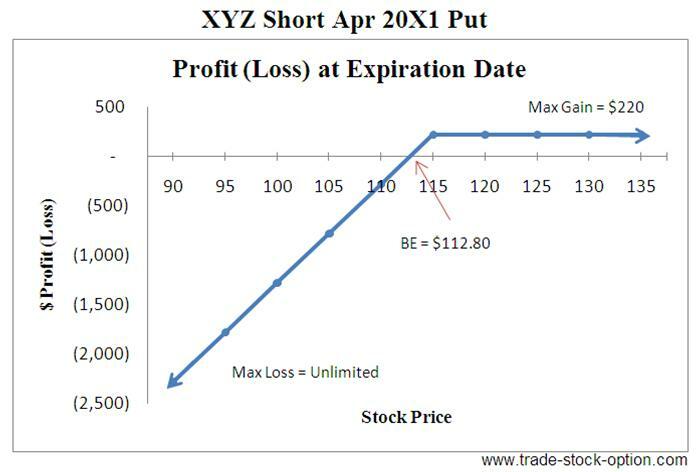 Assumption: XYZ is trading at $98 a share on Mar 20X1 and you bought 100 share of XYZ at $98. You would like to earn additional income (beside dividend) from XYZ and don’t mind selling the stock at a profit. In this case, you may consider to sell one Apr 20X1 $105 strike call at $1.50 to earn an additional income. Note: commissions are NOT taken into account in the calculation. Covered Call writing enable you to profit from a stock that is range bound, take advantage of contraction in volatility, share in some stock appreciation and entitlement to dividend declared. It is primary a bullish strategy but can also profit from a sideway market. Selling an at-the-money Covered Calls has the equivalent position of selling an at-the-money Naked Put strategy. An option position is usually considered to be ”Covered” if there is a fully offsetting market position (in this case, a long stock position). 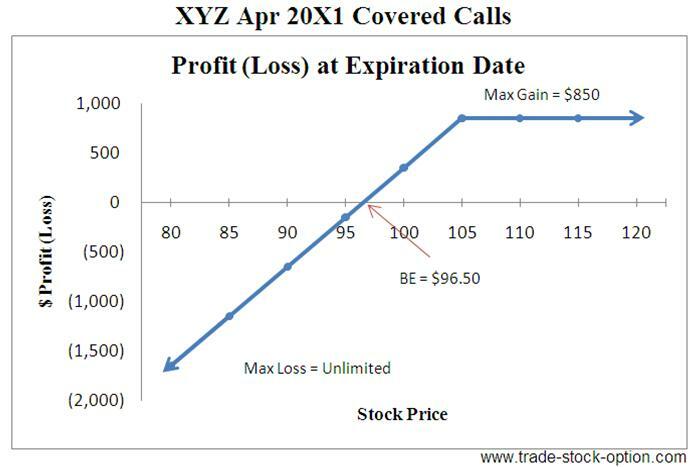 For example, if you own 800 shares of the stock, XYZ, you can write up to 8 call options in a covered call transaction. A Buy Write (also known as covered call write) strategy is a version of covered calls options strategy in which the purchase of stock and sells of call option occur as part of the same transaction. For example, if a stock is trading at $98 a share and a call is selling at $1.50, you can enter a single order to execute the transaction at $96.50 a share or better. By entering the limit order in this manner, you can be sure that you will not be executed on one side of the transaction unless the other side is also executed. Time decay is benefiting you here as it reduces the value of the call options. The last month of an option’s life has the greatest amount of time value erosion occurring. Therefore, selling the premium every month over a period of time will generally earn you a higher return than selling premium a long way out. Provided that the stock does not hit the strike price at expiration date, you will be able to retain the full premium of the stock and start the whole process again the following month. If you wish to retain your stock, then you should select the strike price that is further out of money. The further the call is out of the money, the lower the possibility of getting assigned and losing the stock. However, the premium earned is also lower. If you are comfortable in selling your stock near the current value, you can consider to select the strike price that is at-the-money or in-the-money. In this case, you will be able to earn a higher premium, but this also come with a higher possibility of stock being sold. Do note that an American Style Option can be exercised by the option buyer (holder) at any time before or on the expiration date. Thus if the stock price is above the call strike price, be prepared that you may be exercised and the stock will be sold… at a profit!!! The strike price and time frame is an important ingredient in determining the potential risk and reward of a Covered Calls strategy. You should pick them according to your risk/reward tolerance and forecast outlook of the underlying stock. Having the patient to wait, knowledge to apply and discipline to follow through the option trading strategies with appropriate risk-reward parameters is important to your long term success in option trading. Next go to another bullish strategy, Bull Call Spread, to learn how profit can be make from a bullish stock.